Sometimes solitude can be a very good thing, especially at the end of a stressful work week or the beginning of a new adventure. Time alone with God and my thoughts allows me to sort through painful experiences or ponder plans for something better. Tonight I have done a little of both. After nearly six months of "underemployment" my husband has been offered a full-time job, which he will start soon. I am nearing the end of a season of temporary work, with my contract expiring in just a few weeks. Changes are ahead for both of us, positive changes that will hopefully bring an end to some of the anxiety that we have felt and enable us to pay forward the kindnesses that have been shown to us over and over during this season of financial stress. I have also thought about relationships that have been such a source of joy and anguish for me through the years. Remembering what it feels like to lose good friends, whether by death or distance, and the mistakes I have made in many of my relationships only makes me cherish my loved ones more. God has been so gracious to me. Even in allowing me to love so deeply that it hurts, He has shown me just a hint of the depth of His love for me and demonstrated His faithfulness and devotion to me even when I have loved Him with a divided heart. In my seasons of need and loneliness God has drawn me close and proved His sufficiency over and over and over again. There is no one I love more than Him! No matter what happens tomorrow or next week or next year, I know that I will be okay because God has promised never to leave or forsake me. With that kind of assurance from a God who is personal and intimately acquainted with all my ways, forgiving me even when I am at my worst, how can I feel anything but joy? When I become fretful, wistful, and melancholy, I have only to remember the One who knows my thoughts and tell Him, "I love and trust You, Jesus," knowing that He loves me in return and trusts me enough to carry the burdens He allows so that the faith of others may be strengthened and their love for Him, rekindled. Thank you for visiting my blog! You are encouraged to post a comment and share this blog with a friend. By sharing, you are helping to encourage others with the truth of God's Word! On a recent Saturday night, my daughter Joy and I, both hungry and bored, tried to figure out where to have dinner. Although Joy was craving Mexican food, I was in the mood for some of the best catfish and sweet tea east of the Mississippi! 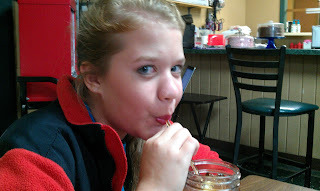 Needing a break from the ordinary, I decided to make the short drive to the town of Rossville for tasty home cooking and unparalleled southern hospitality at the Wolf River Cafe, just a few miles east of Collierville in Fayette County. Upon entering the cafe, we were warmly welcomed by owner Susan Quasdorf and her friendly staff, who went beyond the customary "Hello. Can I start you off with a drink or an appetizer?" The hospitality of the staff and casual charm of the restaurant were a welcome change from a stressful week as the staff went beyond the call of duty to make each guest feel special. During our entire visit the conversation and service were completely focused on the patrons who dined there. The food was predictably delicious, hot, and satisfying! 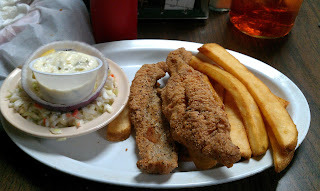 Joy and I both ordered our favorite meal, the two-piece catfish dinner, which was preceded with a basket of hushpuppies and pickled green tomatoes. The meaty boneless catfish fillets were fried to perfection -- crispy on the outside and steaming hot on the inside. The steak fries and homemade coleslaw which accompanied the catfish were equally delicious. To wash it all down, we ordered the cafe's sweet tea with lemon, served in Mason jars. Sadly, we left no room for one of the many fabulous homemade desserts that beckoned to be devoured! If you are looking for great home-cooked food and friendly service in a casual country atmosphere, then make the short drive to Rossville and dine at Wolf River Cafe. Not only do they have a great dinner and lunch menu, I'm told they have one of the best breakfasts around and that the pizza is to die for! 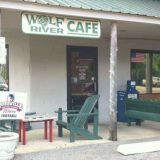 For more information on Wolf River Cafe, click here. For directions to Wolf River Cafe, click here. As I was posting a comment on Facebook the other day I found myself typing the words, "holy exhaustion." There have been nights when I have laid my head on the pillow satisfied that I have given my all, lived to the fullest, and done my very best. Days like that don't come often but they do come. What would it take to make each day one that ends in holy exhaustion? Sometimes exhaustion comes not from what we do, but from agonizing over what we don't do in a given day. More often than not, my exhaustion is of that kind and makes for a very restless night's sleep. Giving up at the end of the day and going to bed at a decent hour are nearly impossible when I have wasted time. Anxiety and guilt creep in, stealing my slumber and leaving me filled with regret. How can we ensure that we have a day that ends in holy exhaustion rather than anxiety and sleeplessness? I'm not sure we can, but we can certainly try by first committing our day to God. Even more than my first cup of coffee in the morning, I crave my time alone with God. Having the opportunity to know more of His character and gain some sense of direction by reading His Word are critical, no matter how my goes. If I start the day off with God, I can know as surely as autumn follows summer that God will be with no matter the direction I take. It also helps to have a surrendered plan. To do all things decently and in order, we must make a plan or to do list then attempt to work through the items on the list, knowing that ultimately God is in control. If He chooses to divinely interrupt my plans, I know that it's because He has a higher agenda than mine. I don't know about you, but when I resist God I have to work even harder to do what is needed to accomplish His purposes. It is far better to surrender any plans I do make and let Him have His way with my schedule and priorities. Finally, dump the guilt! There is always going to be a voice accusing you of mismanaging your time or failing to achieve an important goal. If you are sensitive to the Spirit of the Lord, then you will know when it is Him instructing you or Satan accusing you. You will also know that it is okay to step back and relax a little, especially with friends and loved ones, and let the toilets wait until tomorrow! Pray for wisdom to manage your time well, energy to accomplish the important things, and the discernment to know when it is time to abandon your agenda and embrace God's. At the end of the day you will find there is no greater joy or more effective sedative than the holy exhaustion that comes from being in the center of God's will and abandoning your agenda for His glory. During the five months since my husband lost his job, our friends have encouraged us with their prayers and gifts. God has demonstrated His faithfulness daily by providing everything we need in such sweet and amazing ways. You would think all this would be enough to make me feel better about everything, but I am still restless and edgy much of the time. Despite all the blessings, encouragement, and affirmation we have received, I have been plagued by uncertainty about our future. We are all living with a great deal of uncertainty, especially in these troubled times. As we struggle to find answers to questions about our future and God's plans for us, we need to embrace and live according to this truth: The future is now. Therefore I tell you, do not worry about your life, what you will eat or drink; or about your body, what you will wear...Look at the birds of the air; they do not sow or reap or store away in barns, and yet your heavenly Father feeds them. Are you not much more valuable than they?...But seek first his kingdom and righteousness, and all these things will be given to you as well. Therefore do not worry about tomorrow, for tomorrow will worry about itself. Each day has enough trouble of its own (Matthew 6:25-34). In this season of financial uncertainty, God has carried out his promises to provide for us time and time again. How dare we doubt that his plan for us, even though sometimes hard, is anything but good? (Jeremiah 29:11). In Ephesians 5:15, we are commanded to "Be very careful, then, how you live--not as unwise but as wise, making the most of opportunity, because the days are evil. Therefore do not be foolish but understand what the Lord's will is." This has so many practical applications, from using our time well to being good stewards of our money. When our time is well-spent doing what God has called us to do and enriching the lives of others, we are less prone to panic attacks and pity parties and more prone to the fulfillment of knowing that we are making a difference in the lives of others who might eventually come into a personal relationship with Christ. Had I embraced the "future is now" philosophy, I would have set aside money for the rainy day in which we are now living rather than recklessly overspend our budget assuming that future income would pay off current debt incurred for things that we didn't need or couldn't afford. I would have learned early on "the secret of being content in every situation, whether well fed or hungry, whether living in plenty or in want" (Philippians 4:11-12). If we can begin living now the way God teaches us in his Word to live, then one day we will be able to look back and see how each "now" led us into the glorious future God had in store for us all along. As we fear the LORD, he will instruct us in the way chosen for us and we will spend our days in prosperity (Psalm 25:12-13), blessed so we can be a blessing to others. Although I had planned to spend the rest of my life writing books and reaching the masses for Christ, God decided I needed to take the "scenic route" to the land of humility. Because of circumstances beyond my control it was necessary for me to lay aside my big plans and find a full-time job in order to help provide for my family. For the past couple of months I have been working full-time in a temporary capacity for a local business. The recruiting agency contracted my services through the middle of December. Even though some have expressed a desire that I stay on beyond the end of my contract term, I continue to remind them and myself that "I'm just temping." Only God really knows how long I'll work there, or anywhere for that matter. 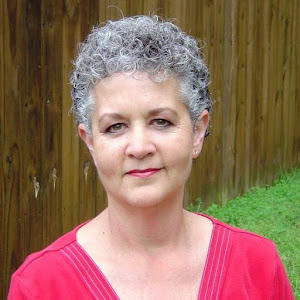 Only He knows when my husband will receive an offer for a full-time job or if I will ever go back to writing books and reach the masses for Christ. And even though I don't know what the source of His provision will be in the days ahead, I know that He will provide. Even though being a temp carries a bit of uncertainty, I have the assurance that God has everything under control and that His plan for me is a good one. The Bible tells us that we are all temping in one way or another because all our trials and tribulations on this earth are temporary. "For our light and momentary troubles are achieving for us an eternal glory that far outweighs them all" (2 Corinthians 4:17). Depending on the assignments He has given us -- chronic illness, financial reversal, or ministry -- our time spent in each could be long or short, but it will be temporary. I don't know about you, but I believe I can get through any difficulty as long as God is in it with me, and He certainly promises to be. "When you pass through the waters, I will be with you; and when you pass through the rivers, they will not sweep over you. When you walk through the fire, you will not be burned; the flames will not set you ablaze" (Isaiah 43:2). What assignment has God given you? Are you tired of the same old thing and ready for something new and better? Sure. We all are. But even the better things are temporary. God is saving the best for last -- an eternity with Him. He's the real deal, the sure thing, and the only One who can satisfy our deepest longings. If you know Him, your eternity has already begun. Even though things might be difficult now, it will only get better as each day brings you a little closer to the time when you will be in His presence forever. Hang onto Him when the days are hard, but dare to let go, throw your hands in the air in worship, and know that the roller coaster will come to a stop and that when you exit the ride, you will enter heaven, where there is everlasting joy. If you think that you aren't good enough to spend eternity in heaven, understand that none of us are good enough. But Jesus, in all His goodness, laid down His life on the cross to pay for our sins and make us holy and righteous in the Father's eyes. All you have to do is acknowledge your sin and your need for salvation, and pray the following prayer asking Jesus to be your Savior. Lord Jesus, I acknowledge my need for your forgiveness today. I have sinned against you and I want to be saved from my sins. Thank you for dying on the Cross to purchase my salvation and erase my sin debt. Please live in my heart and be my Lord and Savior. Teach me your truths and lead me in the way I should go, that I may follow you all the days of my life. There are certain times of the year when we stop to take stock of our lives, assess our progress toward our goals, and reflect on where we are spiritually. For most of us, New Year's Eve is that occasion. For others it may be an anniversary or birthday. For me, those times come frequently, often blindsiding me and driving me to my knees. Even now as we cross the threshold into the holiday season I find myself looking back on the past several months and anticipating better things ahead. It isn't even Thanksgiving yet, but I feel thankful despite the trials of the past several months. In a season of financial reversal, God has remained true to the promises in His Word to provide for our family in ways we could never have imagined. Still waiting for a job offer for my husband, we are eager to put the challenges of this summer and fall behind us and move into a more prosperous season of our lives. But as difficult as these past months have been, I consider them a gift. Yes, a gift from God. You see, as we have searched for jobs, praying ceaselessly and waiting less than patiently for prayers to be answered, God has taught me to be still and know -- beyond the shadow of a doubt -- that He is indeed God. God, who is able to multiply loaves and fishes to feed a multitude. God, who is able to provide for our needs over and over again when there wasn't a dime in the bank account or an ounce of gas in the tank. God, who continues to make a way where there is no way. When was the last time you really sensed God working in your life? Have you considered that the difficulties you are experiencing are not just random bad luck but perhaps His way of drawing you closer to Him by bringing you to a place of such dependence that He is your only answer? I encourage you to take time to sit still, perhaps with a journal and your Bible nearby, and just listen to what God is whispering to you in the middle of your raging storm. Ask Him specifically to give you a word, jot down what He impresses on your heart, then look to His Word for your answer. It is there, just as surely as He is with you. Be still and know...He is God!